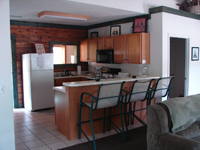 Max Occupancy: 7 Three bedroom cabin. 1st bedroom has 1 queen, 2nd bedroom has 1 queen and 2nd bedroom has 3 twins. Has 1 bathroom with a large shower. This cabin includes a full kitchen and a living room/sitting room. It is also equipped with a washer and dryer.